Obtaining a license key is quick, easy and secure. We use PayPal as our payment processor to allow you to purchase our products online using any major credit/debit card or bank account. By proceeding to the payment you acknowledge that you read and accepted the Terms and Conditions of Sales. The License Key will be delivered via email to the email address associated with your PayPal account. If you don't receive an email within a few hours, please check that it hasn't been caught by junk mail filters. 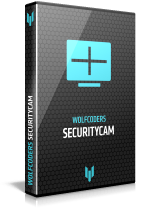 If you still can't find an email from us, please contact us at support@wolfcoders.com. All program updates are free of charge, except major updates. All minor and major program updates are free of charge. The price is shown in Euros, but PayPal will charge in your own currency, US Dollars. You can view the conversion rate at the time of the transaction. Review the displayed exchange rate before you complete your payment.